When epoxides are exposed to light or heat they can form carbonyl ylides in an electrocyclic ring-opening reaction. Some epoxides are used in photochromic sunglasses where the highly colored ylide absorbs the incoming light. Another interesting feature of this epoxide ring opening is that it obeys the Woodward-Hoffmann rules as evidenced by the behaviour of diphenyloxirane, a well-studied epoxide representative. 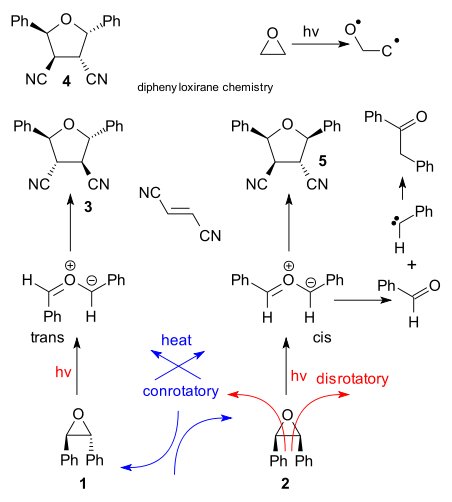 Thus, the thermal 4 electron ring-opening of the trans-epoxide is expected to give the cis-ylide in a conrotatory fashion and the disrotatory photochemical reaction the trans-ylide. How can you tell? By adding a chemical trap such as dicyanoethylene which captured the ylides in a 1,3-dipolar cycloaddition. When left to it's own devices the ylide can fragmentate to the aldehyde (benzaldehyde) and the carbene eventually forming deoxybenzoin by recombination. Predictably in cyclohexane , photolysis of trans-epoxide 1 gives tetrahydrofuran 3 (but not sterically challenged 4), less predictably in acetonitrile 3,4 and 5 are formed in equal amounts (Lipson et al. 1998 DOI). Is computational chemistry able to predict/confirm the Woodward-Hoffmann rules? The research group of Irmgard Frank (website) is specialized in molecular dynamics of photoreactions and in a most recent venture the entire reaction path for oxirane ring-opening was computationally (CPMD / BLYP) traced (Friedrichs & Frank DOI). In accordance with experiment the weakest link in unsubstituted oxirane is not the carbon-carbon bond at all but the carbon-oxygen bond resulting in biradical formation. In the made-for-movie simulation of this process here we can see the oxygen atom completely dislodged and in the biradical bond breaking and formation continues. With diphenyloxirane the ground-state reaction predictably proceeds conrotatory to the cis ylide. The singlet state too behaves predictably which is a surprise because until now all static simulations (computing only one reaction coordinate, each snapshot calculated independently) have failed to differentiate between conrotatory and disrotatory paths. The movie can be seen here . Notable features: the C-C bond is gone in 50 femtoseconds well ahead of all other structural rearrangements and preservation of C2 symmetry throughout the rearrangement is an illusion.